Bad offers destroy fitness businesses. The wrong offer attracts weak clients that don’t stay with your business (or doesn’t attract anyone at all). This means hours of time wasted with “deal hunters” that use up available spots with free trials, exhausts you, and either won’t convert or will rapidly turn over ... requiring you to run faster and faster on a treadmill trying to find more clients. Unfortunately, too many fitness professionals and business owners have to learn this lesson the hard way. One of our clients got a ton of leads and free trials by running a special free offer with Facebook ads. She got hundreds of “leads” (email addresses) and dozens of clientele who streamed in for the “free trials” that took up her time and energy. At the end of the trial, guess what results she was left with? Just two new long term clients. 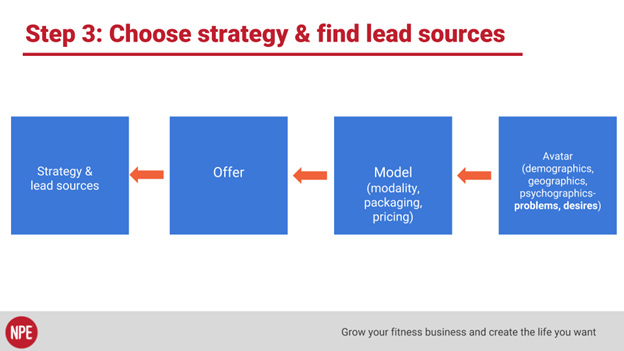 If you want to grow a profitable fitness business full of long-term clients you love working with (not transactional ones), then you must align your ideal client, business model, fitness modality, offer, strategies, and lead sources–you must get all of them in a straight line. Whether you’re just starting out or whether you’re not getting the growth you want, you must get crystal clear on whom you want to serve. If you don’t choose your clients, your clients will choose you. You’ll always be reacting to the market. You won’t be able to be strategic with your marketing ... because you’re looking for, well, anybody who will show up. It’s no way to run a business, make a profit or earn a living, and it’s not a fun way to live your life. But too many fitness professionals find themselves stuck in this place. Why did you get into this industry? What types of problems do you most LOVE solving? What goals do you LOVE helping someone achieve? Are their clients you DON’T want to work with? Hint: Usually that’s NOT bodybuilders, grandmas, pro athletes, and overweight kids ALL at the same time. You are looking for someone who is emotionally driven to solve a problem and achieve a goal. Choose problems you’re motivated, inspired, and have competency around solving (pain, mobility, strength, fat loss, etc.) And connect that to the types of clients you most love working with (people who are willing to invest in solving those problems). Pick a lane. Run it and don’t stop. Their business model doesn’t match “value creation” for their avatar. Someone in their sixties is looking to get out of pain and injury, and the fitness professional throws them in a Crossfit group class on Day 1 ... with no assessment. That’s a total mismatch about what that person’s problems and goals are, and what program and model and modality will best support them in solving that problem. Their offer doesn’t match their business model. Someone is looking to start a fitness program to support improving their challenges with diabetes or lupus, and the fitness professional is marketing a 12-week “get ripped for the beach” body transformation program. That’s not really the reason why they’re looking to start a fitness program nor their primary goal. It’s a mismatch between the offer and what they want and need. Or the fitness professional uses a 7-day free trial that you might use for a group-training program, but that doesn’t work for high-priced personal training. That’s a real mismatch in how we value our time and expertise as professionals. Their offer doesn’t align to creating value (solving problems and fulfilling desires) for their avatar. The offer doesn’t move the needle for the person. So, if you have someone who needs to lose 100 pounds, and they sign up for my 3-week bikini body challenge, that’s not a good fit. They need a long-term program. A 3-week low-barrier offer (LBO) is a mismatch to the person’s needs. Client avatar problems/desires. Know what your client avatar will pay a premium price for you to solve or fulfill. Modality. The training system or protocols you’ll use to solve the problem (personal training, functional fitness, CrossFit, Pilates, Yoga, martial arts, wellness coaching, nutrition coaching, etc.). Model. What you sell, how you fulfill, and how you structure the business to make a profit while solving the problem. Generally, that’s group training, semi-private training, or private training... but not all three at the same time. Only then do you put together your offers. These include free trials, free consults, paid trials/challenges (3, 6, 12 week), and paid assessments (see chart below). The key is alignment and doing this in the right order. Does your model and modality best solve the problem and achieve the goals that drive my avatar? Does my offer align with short term value creation in solving the problem and achieving the goals that drive my avatar? Look for mismatches in alignment ... find and fix them. The better this connects, the easier you’ll find success with engaging the right clients. You pick the right avatar, ensure they are willing to invest in solving that problem or fulfilling that desire, and that your model and modality get the job done. 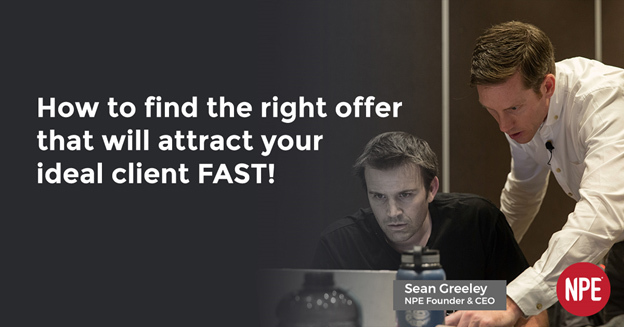 When you’ve got those right, then you must connect the right offer, at the right price point, to start attracting the right people to your business. Most fitness professionals overcomplicate things. But focusing on increasing followers, likes, comments, engagement is the wrong move ... NONE of that (really) matters. Lead generation is like fishing. You start with what fish you want to catch (prospective client). You dangle bait they will like (your offer). You bring the right fishing rod with the right pound-test-strength line (strategy). And then you head to the right pond where the fish are biting (lead source). Say someone has a serious health issue like lupus or diabetes, do they scroll through their Facebook feed looking for an ad that will offer a solution to that problem? No way. They go to a health practitioner, naturopath or physical therapist for a reference (and if that’s your avatar, you should be working closely to establish partnerships with each of those practitioners to refer you). Or they go to Google and search “fitness with lupus in Chicago” or something related. So, having good Google ads focused on keywords that matter will make sense for your business. The more serious the problem, the more people will research for the best solution and put time into finding a provider they can trust. If you want to attract more of the right clients for your business, then take the time to get very clear on your ideal client avatar, their problems/desires, and their willingness to invest. Then use the right offer to attract and move them forward in the sales process of becoming your client. When you get those first two right, the third item gets pretty easy--strategically connect and engage new clients in your chosen market. If you’re serious about growing a client base and earning a professional income to support your goals, you have to get strategic. Get a plan and get focused on executing that plan efficiently, and you’ll be well on your way. 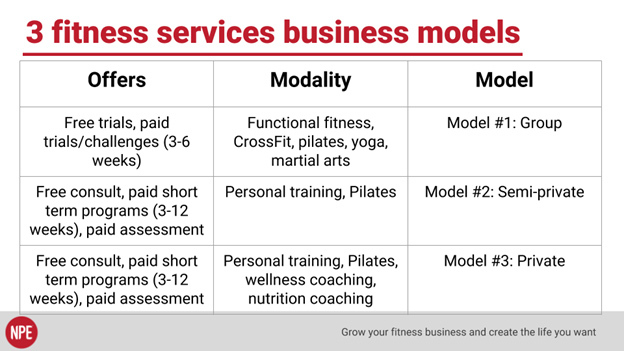 9 Fitness Business Models: Which One Is Best for You?